The role of the Nuclear Factor κB (NF-κB) transcription factor family in T cell function has been well described. The c-Rel family member is of particular importance in initiating T cell responses to antigen and regulating activation of inflammatory cytokine genes, including the Interleukin-2 (IL-2) and Granulocyte macrophage colony stimulating factor (GM-CSF) genes. c-Rel is required for chromatin remodeling of these gene promoters, which involves depletion of histones from the promoters in response to T cell activating signals. These chromatin remodeling events precede transcriptional activation of the genes. The subsequent down-regulation of cytokine gene expression is important in the termination of an immune response and here we examine this process at the murine GM-CSF and IL-2 genes. We show that the cytokine mRNA levels rapidly return to basal levels following stimulus removal and this is associated with reassembly of histones onto the promoter. Histone reassembly at the GM-CSF and IL-2 promoters occurs concomitantly with depletion of RelA, c-Rel and RNA polymerase II from the promoters. Furthermore we show that transcriptional down-regulation and chromatin reassembly is dependent on depletion of c-Rel from the nucleus, and that this is regulated by the nuclear translocation of the NF-κB inhibitor, IκBα. 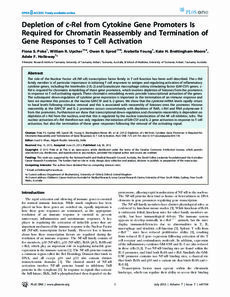 The nuclear activation of c-Rel therefore not only regulates the initiation of GM-CSF and IL-2 gene activation in response to T cell activation, but also the termination of these gene responses following the removal of the activating signal.